Storying Sheffield 2012 | Amber Regis :: "Looking Glasses At Odd Corners"
The presence of the past — of former times and different selves, recalled in the here and now — proved to be a serendipitous image for the day ahead. I was on my way to attend the third annual Storying Sheffield exhibition at the University. The event marks the culmination of a second year English module bringing together undergraduate students and members of the local community . Over the course of a semester, residents and students work together to produce stories about life in the city. These take many forms and are not limited to words on paper. A host of narrative artefacts were on display, crossing and blurring genres, from maps and sculpture to photography and portraiture, from collage and assemblage to textiles and film. The exhibition, then, formed a composite portrait of the city: a ‘meta’ biography of Sheffield drawn from the life stories of those living within its borders. 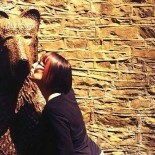 But it was not a portrait you might expect, nor was it simple. Living as a student in a city you have adopted (and which has adopted you) is something of an immigrant experience. And teamed with this outsider perspective were the stories told by marginalised voices: short course students drawn from the long-term unemployed, older communities and those who make use of mental health services. It was heartening to see the legacy of Storying Sheffield also on display at the exhibition. The continuing work of former participants was showcased, including an exhibit on the local history of Hillsborough curated by After Storying Sheffield, a group set up by former short course students. Undergraduates progressing into their final year are able to continue their involvement with Storying Sheffield by pursuing community engagement projects. Some of the most striking exhibits were the books produced by Annie and Isla as a result of their work with people living with dementia. These books were a representation of deterioration, of the loss of parts of one’s memory — that store of narratives from which we construct our life stories. They had been cut and pieces were missing or moved out of place. On some pages the text had been entirely removed, only pictures allowed to remain; as each page was turned, these images would layer on top of one another, an accumulation of fragments. Long, tangled cotton threads were sewn through the leaves; they were difficult to follow, their routes becoming tangled. 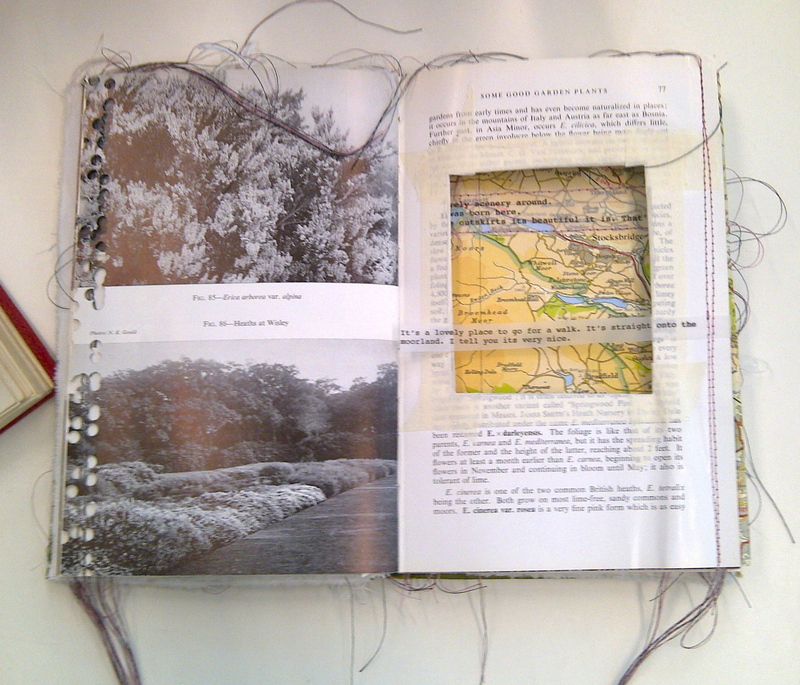 These book were a symbol for the repository of memory, shot through with gaps, holes and lost threads. 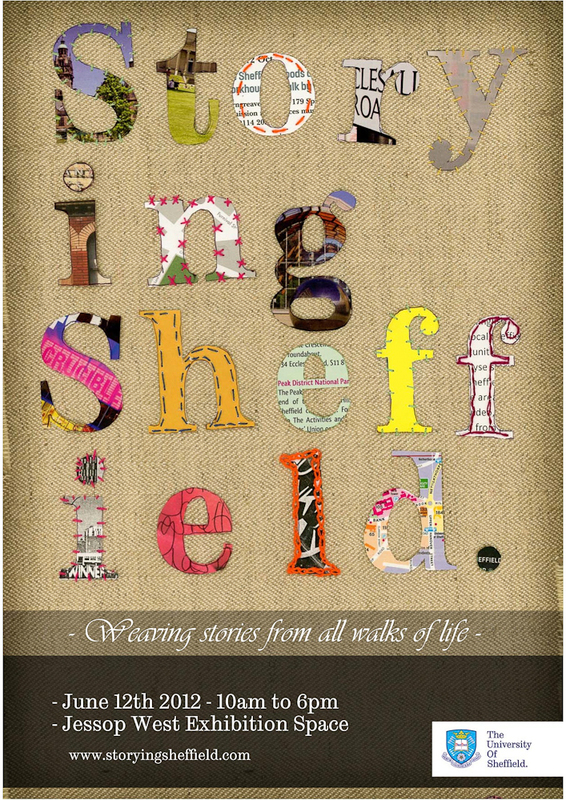 The Storying Sheffield tagline is “weaving stories from all walks of life” and this year’s exhibition poster was an embroidered collage. These textile metaphors were appropriate for a module and project that combines disparate elements, breaking down barriers that too often separate a University from its city, students from local residents, and the visible from largely invisible members of society. As I move to Sheffield this week to join the University in September, I look forward to seeing next year’s Storying Sheffield module in progress. George Eliot, Middlemarch, ed. David Carroll (Oxford: Oxford University Press, 2008), p. 578. Storying Sheffield is convened by Dr Brendan Stone and Dr David Forrest in the School of English at the University of Sheffield. This entry was posted on August 25, 2012 by AmberRegis in academic, autobiography, biography, memory, objects, Sheffield, Uncategorized.